Christmas is thrilling. Excited children. Cozy family time. Cherished traditions. Much like the anticipation for the very first Christmas. And Christmas wasn't late. It was right on time. At the perfect time in history. That first Christmas in Bethlehem over 2,000 years ago brought the hope of spiritual adoption. Through Jesus Christ, we can be forgiven and made a child of God. Relationship with our Creator God is restored again, as it was at the beginning of time. Relationship restored because the wrath we deserved for our cosmic treason was not poured out on us, but on His Son. But this Christmas, as wonderful at it will be, is only a glimpse of a future "Christmas" that the whole earth is anticipating! Don't you see the longing in every person for peace, for joy, for security, for complete satisfaction, for complete belonging? It is every heart's cry. Every time we take a step in this adoption process, it reminds me anew of God's adoption of His children. When we stand before a judge in another land, and he declares our daughter to be a part of our family, the adoption will be completed. However, we will have to leave our little girl at her orphanage one last time, while we return to the States, waiting for the finalization of paperwork to bring her home for good. Isn't the comparison stunning? While we can be forgiven, redeemed, and adopted into God's forever family right now, we are still awaiting His final return to take us home. We are waiting for the best "Christmas" morning yet to come! Since God kept His promise and sent His Son that first Christmas long ago, I know He will keep His promise and Christ will return. And in the mean time, our family will seek to live out lives of faith. And with joyful hope, we trust that next Christmas, this little seat on the end will be filled. A promise kept. An orphan chosen. A faithful God. This is our first year having a Jesus Tree. Yes, we still have our traditional tree in the living room with all the sentimental and family ornaments on it. But we wanted to have a way to intentionally focus on Christ and the amazing Christmas story. So what better way than by focusing on the significance of at least 24 names of Jesus leading up to Christmas. Did you know that in the Old and New Testaments, it is possible to find over 100 names and titles for Christ? This DIY Christmas project cost very little, but it has produced some wonderful dinnertime conversations with the boys. Here's how we set up the Jesus Tree. Last year after Christmas, I bought 2 packs of glittery snowflake and star ornaments in the clearance section for next to nothing. Then, we gathered branches from the yard and put them in a recycled jar. I used a paper punch to cut out circles and scallops, on which I wrote one name of Jesus with the reference. These names were simply hot glued to the ornaments. I found the Names of Jesus unit study here, with activities to do with the kids if you want. We're just sticking to simply talking about the names, and it's been great. Great for the grown-ups too! And so if you'd like to try this with your kids at Christmas, don't think you're too late. You can still study a dozen names this year. Or, you're early enough to plan ahead for next year. Check out those clearance aisles for some ornaments you can use. Print off or Pin the Names of Jesus unit. It's been a great DIY advent-type project as we count down the days till Christmas in a more meaningful way. Linking up at The Homemade Christmas Linky Party at It's Just Laine & Transformation Thursday: No. 182 at the Shabby Creek Cottage! While sensing God's leading in our lives toward adoption, one of the first books we read was Russell Moore's Adopted For Life. 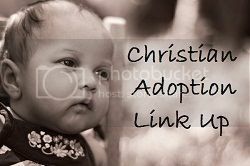 Now, if you're not considering adoption, don't stop reading this post. This book is not just for adopting families, rather it investigates the gospel connection in the adoption of children. If nothing else, this book will stir your heart as you appreciate the beauty and glories of the gospel and the doctrine of adoption. If you would like a taste of what this book is about, you can watch an interview with Russell Moore about his book. One of the most amazing discussions in this book is about the "Abba Father" cry from Romans 8:15. We had always heard this verse explained as the sweet coo of a baby saying "daddy." But when you put it in context, it is more of a heart wrenching scream that underlines the fact that someone is finally listening. You see, Moore adopted two boys from Russia. When he and his wife visited the orphanage, it was eerily quiet. The babies had learned that no one would come if they cried. So they stopped crying. After a week of visits with their boys, and on the final day when they had to return to the States until court, their one son finally let out a terrifying scream. Why? Because he finally knew at some level that he had parents -- people who loved him, people who would respond when he cried out. See how the doctrine of adoption puts a whole new weight to a verse such as this? If you have been adopted by God, we hope you will take the time to watch the interview about the book. It will encourage your heart as you stand in awe of the gospel and our amazing God. And if you don't have a relationship with God in which you can cry out to him, then we encourage you to explore what being in a relationship with God is all about. Update: We are now signed up with amazon to benefit from your online purchases when you use our link. This is a great new way to help us with our adoption every time you shop on amazon.com! So, consider purchasing a copy of Adopted For Life using our amazon link below. The first link is for the book, the second link is for Kindle. Thanks!